Cumin, coriander, cardamom, cinnamon, nutmeg, allspice, black pepper, ginger… If you are serious about your cooking, you will find there are lots of spices for you to choose and begin to worry about how to store them and make them easily access. Or if you just need few of commonly used ones, present them in a cute container and surprise your guests will be fun as well. 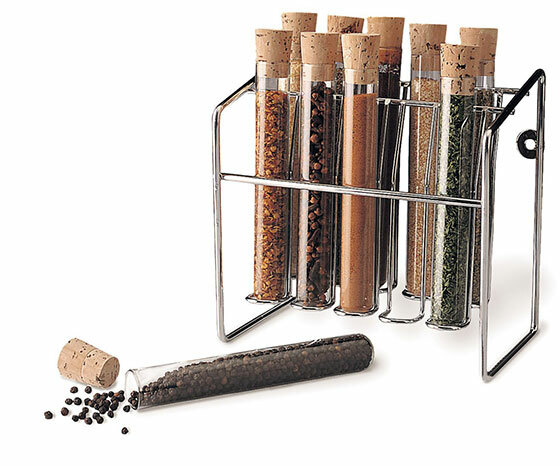 Hence, we handpicked 10 cool spice containers/racks in this post. 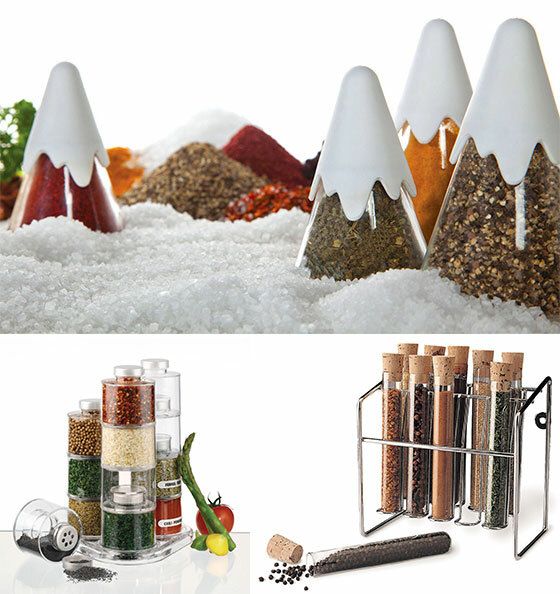 Hope it can give you some ideas to store your beloved spices in style. 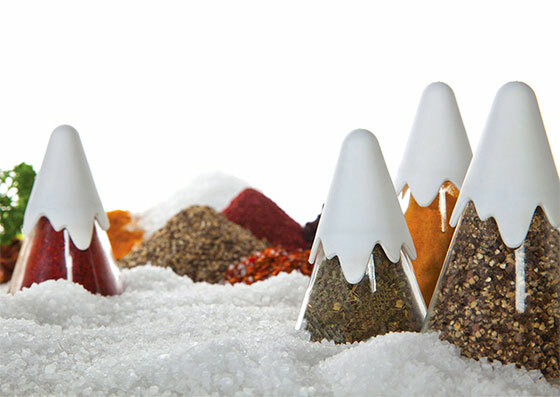 These cool new Himalaya Jars are whimsical glass spice containers shaped like snow-capped mountains. 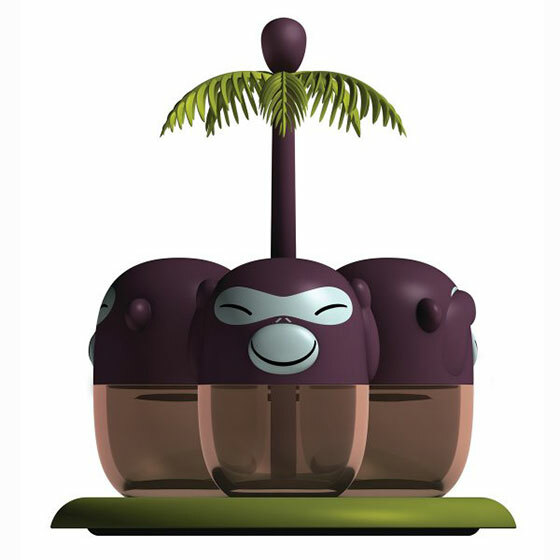 They come in a set of four in different sizes resembling a mini mountain range on your kitchen counter. 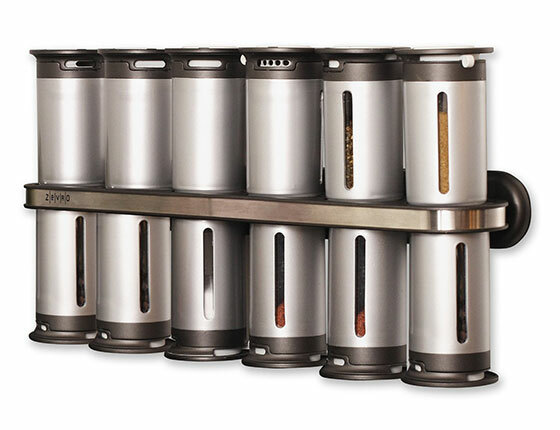 Zevro’s Zero Gravity 14-Piece Magnetic Spice Rack features unique space-saving design to keep spices close at hand but out of the way.Set includes 12 spice canisters and 1 metal shelf. Also includes spice label stickers and mounting hardware. Top and bottom canister placement allows for maximum capacity. Easy one-handed operation uses 3 settings: closed, sprinkle, and pour. 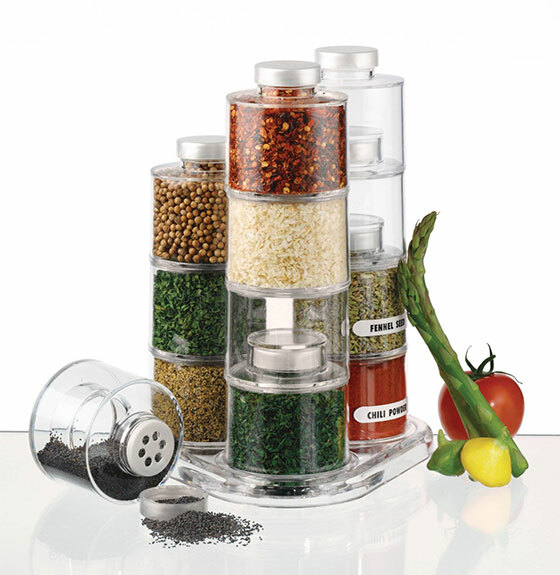 Airtight to preserve freshness with clear viewing window for easy of spice identification. Each canister holds up to 1-3/4 ounces. 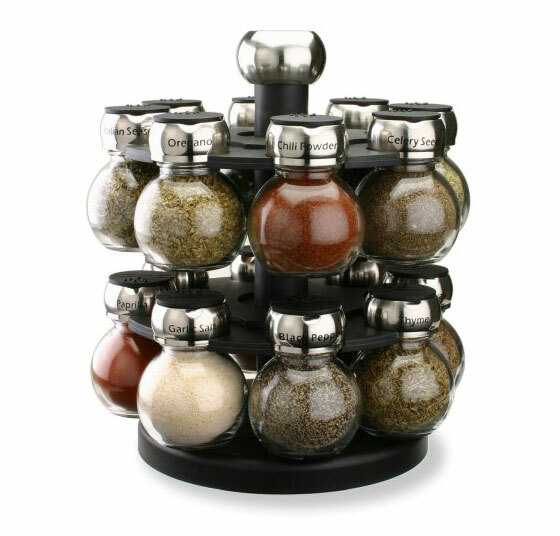 Chrome wire rack holds ten of your favorite spices. Glass tubes have a natural cork stopper for airtight freshness. 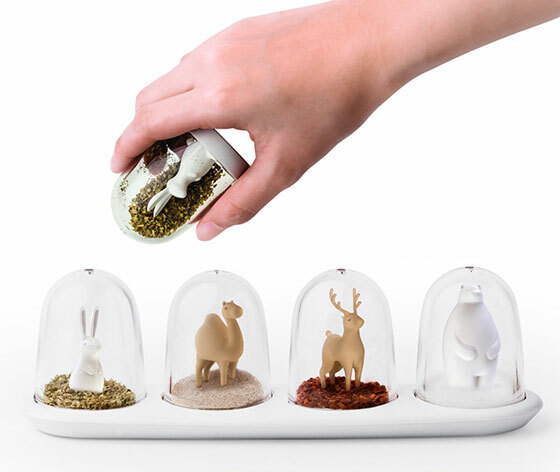 Daydreaming of following Alice to her wonderland in order to dine with cute animals is after all the story of the past with the arrival of Animal Parade – Seasoning Shaker! Hopping right on your very own dining table is this lovely set of dining companions which comprises of four cute friends that will surely spice up each and every meal while the imagination is being fed along the way. 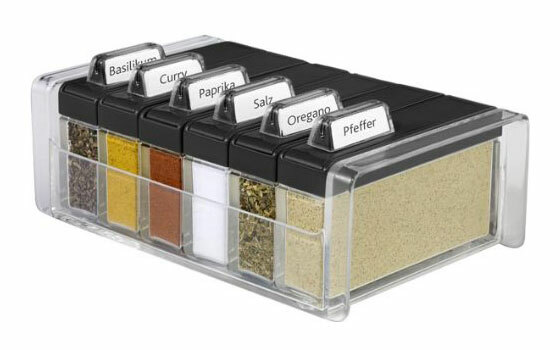 With tabs like a file folder, you can customize your spices the way you want. Available in black or white. 24 reusable magnetic jars; Lids are HAND-STAMPED with spice names by hand. Store on your fridge. Saves kitchen space by freeing up your spice shelf / cabinet (No metal wall plate included–see listing B0094RX7UA which includes plate and saves you $5). 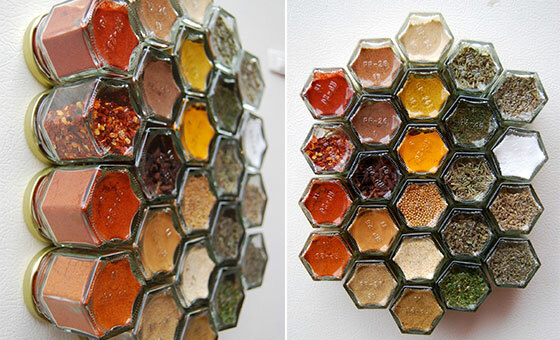 Hexagonal shaped jars fit together creating a honeycomb pattern. Will add a great design to your kitchen!Jars measure 1 3/4″ x 2″; Contains 1.5 oz volume. 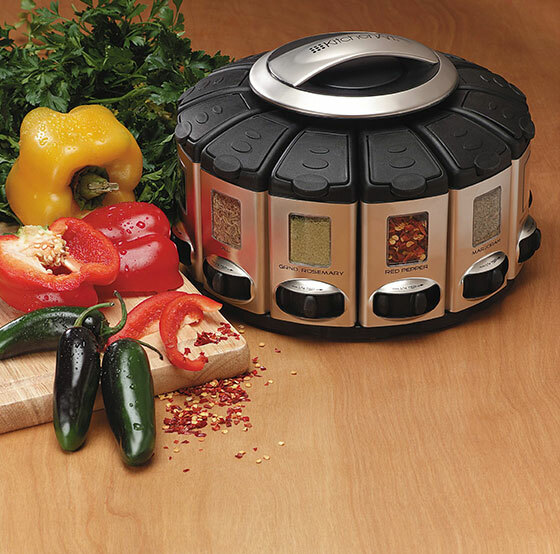 Small size keeps spices fresh, as you will cycle through more often. All spices are ORGANIC; filled with herbs, spices and hand-blended seasonings.